Venezuelan President Nicolas Maduro said on Wednesday that he had reached an agreement with Russia's top oil producer Rosneft to invest $14bn (£9.2) in Venezuela's oil and gas sector. 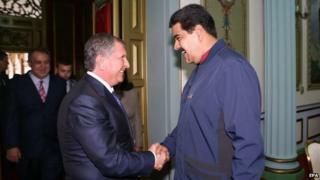 Speaking after a meeting with Rosneft chief executive Igor Sechin, Mr Maduro said the money would allow Venezuela to double its oil production. But he gave few details of the deal. Venezuela is one of the biggest oil exporters worldwide and claims to have the world's largest crude reserves. Rosneft said that the $14bn constituted its total investment in current and future projects in Venezuela. In comments emailed to Reuters news agency, Rosneft said it had already invested $1.8bn in Venezuela from 2010 to 2014. Venezuela, which is heavily dependent on oil money, has been hit hard by falling oil prices. It is estimated that 96% of its export revenues come from oil. Fresh investment in Venezuela's oil sector, which it is seeking to expand, would therefore be a boost to the president. Venezuelan state oil company PDVSA wrote on Twitter (in Spanish) that it had agreed with Rosneft to "create companies together" to boost production of crude oil.